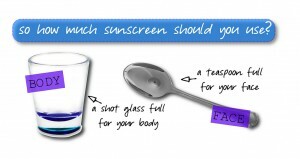 What You Need to Know About Sunburns! Days spent at the beach or by the pool is one reason we love summer but sometimes this enjoyment renders one caveat: leaving us lobster hued. Sunburns can be painful and in some cases be accompanied by blisters. Note: If you have blisters and severe swelling, seek medical attention immediately. But once your sunburn heals and the peeling has stopped, all is good right? Not really. Sunburns can double your chance of developing melanoma later in life but it may take several years for the damage to show up. Simply put, your skin turning red is an indication that your skin has been severely damaged due to extreme UV exposure causing blood vessels to dilate. The skin starts to lose moisture and hydration causing a feeling of tightness. Although our body can cope with minimal amounts of sun damage, the danger happens when our DNA becomes damaged and its repair process is compromised, which can lead to skin cancer. Application and reapplication of sunscreen is crucial. Ensure you are applying enough- a teaspoon for the face and one ounce shot-glass size for the body- and reapply about every two hours. 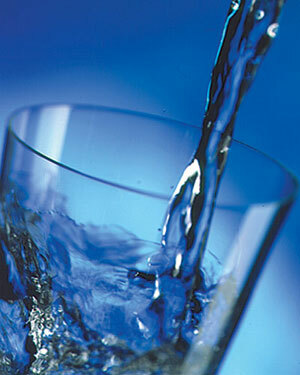 Your body is overheated so it’s important to drink a lot of water. A cold compress or cloths soaked in skim milk can relieve pain-skim milk is the preferred choice because it does not have any fat content. 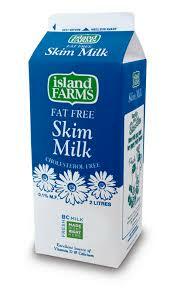 The protein found in milk binds to the burned skin to soothe the pain. 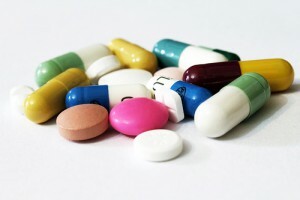 Aspirin or ibuprofen can slow down the inflammatory reaction. Application of a 1% hydrocortisone cream may help with sunburn pain and swelling. 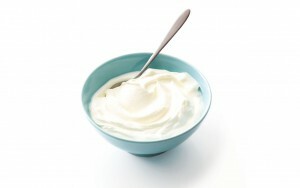 Plain cold yogurt can be used on sunburned areas. Leave on for 10-20 minutes, then rinse off. Until your skin heals, stay away from the sun, heat, friction and excessive exercise and do not pick at loose skin-it can scar! Avoid exfoliating and keep your skincare regimen simple. The key is to soothe and calm inflammation. How do you treat a sunburn? 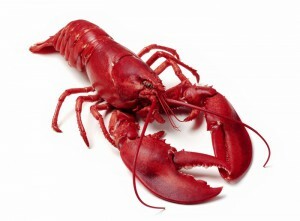 Summer Leaving You Looking Like A Lobster? So what is a sunburn and how do we get relief? When you think about your cleansing routine, is it more like mere seconds of splashing water on your face to get over with or do you try removing every last trace of dirt, scrubbing away until your skin is left feeling raw? While you may not give a second thought about cleansing, it actually involves a delicate balance that sets the tone for everything that follows after. Cleanse with something harsh that disrupts the skin’s natural pH and you can end up with a dry, tight skin that looks aged. Using a cleanser that’s too rich for your skin can result in clogged pores and breakouts. Thoroughly cleansing with the appropriate cleanser helps keep pores clean, prepare the skin for other products, may contain ingredients to counteract various skin problems and can help certain skin conditions such as dehydration and sensitivity. Read below for a guide on cleansers and tips! Cleansers that are oil-based can be good for all skin types and also aid in breaking down sunscreen and makeup. Actors and performers who wear heavy stage makeup can benefit from these types of cleansers as well. Cream cleansers that are rich are best suited for mature skin that is dry; the emollients can soften dry skin and not dry it out. These cleansers are are designed to whisk away oil and deep cleanse. These are appropriate for those with normal, combination, or oily skin. 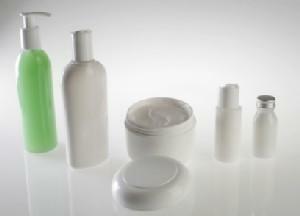 Cleansing lotions (also referred to as milky cleansers) are like that of a cream, just with a lighter consistency. They can be used for normal, dry or combination skin. Different seasons can call for different types of cleansers. Combination, normal and dry skin types may benefit from a cleansing lotion/cream in the fall and winter, but prefer an cleansing gel in the spring and summer when oil production is higher. Use gentle, circular motions and avoid aggressive tugging or pressure. If you use a spinning brush like the Clarisonic in conjunction with your cleanser, use it no more than three times per week to avoid irritation and wash well after each use. Cleanse your face in the morning once and twice in the evening. You don’t have to spend a large amount of time on cleansing- just enough to remove the accumulation of sunscreen, pollution, dirt, debris and oil. Trust me, your skin will thank you. How Well Do You Know Your ABCs? May is Skin Cancer Awareness month. According to the Skin Cancer Foundation, “skin cancer is the most common form of cancer in the United States…[and] over the past three decades, more people have had skin cancer than all other cancers combined.” Since Ultraviolet Radiation (UVR) is responsible for 90% of all skin cancers, taking preventative measures decreases your risk factor for this potentially deadly disease. Here’s what skin cancer is, the different types, what to look out for and guidelines to prevent it. Skin cancer happens when DNA becomes irreversibly damaged, giving way to the growth of abnormal skin cells that are capable of invading and destroying surrounding normal skin cells and tissues. When the damaged cells multiply, a visible tumor is typically formed. The difference between a benign tumor and a malignant tumor is that benign tumors are non cancerous, they won’t usually grow back when removed, and the cells do not invade the surrounding tissue, whereas malignant tumors are cancerous, can grow back after they have been removed, and they invade tissues, organs and metastasize (invades surrounding tissue). Melanoma is the most dangerous type of skin cancer because of its ability to metastasize and spread to lymph nodes, blood, distant tissues and organ systems. If it is detected and treated early, it is almost always curable, but if it’s left untreated, it can often be fatal. This is the most common form of skin cancer in the U.S. It can manifest itself like open sores, red patches, pink growths, shiny bumps or scars, or a brown or black lesion that could be mistaken for a mole. Considered to be the most benign form of skin cancer as it grows the slowest and is the least likely to metastasize, removal can lead to scarring or disfiguring. Squamous Cell Carcinoma chiefly affects the superficial layers of the epidermis (top layer of the skin). 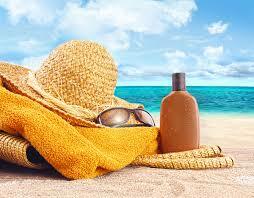 This type of skin cancer is characterized by a red, rough or flaky appearance and causes the skin to thicken. It is most common in areas frequently exposed to the sun, such as the rim of the ear, lower lip, face, bald scalp, neck, hands, arms and legs. 97% of SCC does not spread, however if metastasis occurs, scarring, disfigurement or death is probable. Actinic keratosis can be a precursor to skin cancer that if left untreated, can develop into SCCs. The appearance of AK is rough and scaly, and they can be tan, red, pink or flesh-colored. Studies have shown that 60% of squamous cell carcinomas began as actinic keratosis. Asymmetry If you draw a line through this mole, the two halves will not match. 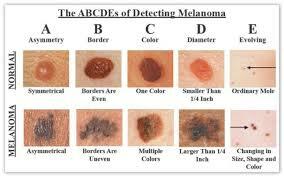 Border The borders of an early melanoma tend to be uneven, irregular, scalloped or notched. Color Coloring varies from one area to another- different shades if brown, tan, or black- and it can become red, blue or some other color. Diameter Melanomas are usually larger than the size of the eraser on your pencil ( ¼ inch or 6mm) but they can be smaller when first detected. Evolution Any changes in size, shape, color, elevation or new symptoms such as bleeding itching or crusting. Seek shade, if possible, between 10 a.m. – 4 p.m. I hope this post was helpful and remember: when in doubt, have it checked out! It’s better to be safe than putting your life in jeopardy.